Looking for a larger space to hold your special party or event? The Deerfield Park District has rooms for rent at several locations, including the Jewett Park Community Center, Sachs Recreation Center, Patty Turner Center and Deerfield Golf Club. Birthday parties, first communion or graduation parties, family gatherings, whatever your special occasion, why not bring the party to “our house?” Basic rentals are for a three hour time period, but we can customize a package to meet your needs. All rental fees and deposits are due in full in advance when the contract is signed. The deposit fee will be returned to you after your event, assuming you have met the terms of your contract. 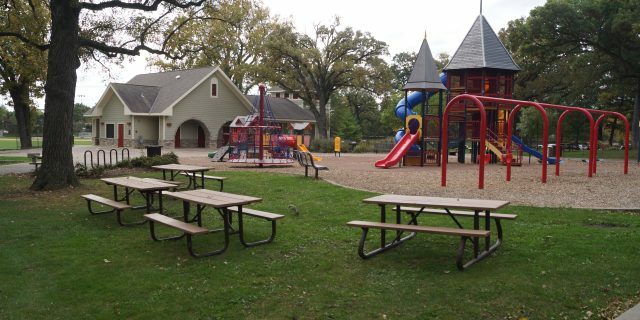 The park district will provide tables and chairs (adult/youth), banquet tables for serving, card tables for gifts, and area rugs for children’s entertainment seating. You supply the plates, cups, napkins, plastic ware, tablecloths (tables are eight feet long), and serving pieces, not to mention the food, birthday candles, bags to take gifts home, and other party materials. Call the Birthday Party/Rental Coordinator at 847-572-2628 for additional information about renting a room at the Deerfield Park District or contact us for more information. Information on pool party rentals is available here. Did you know that you can purchase a permit to have a family picnic at several Deerfield park sites? With at least 48 hours’ notice to approve a permit, your entire family can enjoy full access to playgrounds, barbecue grills, pavilions, and other park amenities. Parks can be reserved online or by calling Mark Woolums at 847-572-2623. Rates apply to individuals, as well as non-profit and corporate groups. One permit is valid for a four-hour reservation. A deposit of $30 is refundable upon the return of the equipment in good condition. Renters will be charged for lost or broken items in the kits. Each registration form has an itemized list for all the equipment in the kit. You must rent the entire kit and we will not split up kits for specific pieces of equipment. All kits are available on a first-come, first-served basis, and you must give us at least 48 hours of notice. Call Mark Woolums at 847-572-2623 to reserve yours today.